A wide range of variants for almost all applications: HEIDENHAIN rotary encoders feature a broad spectrum of interfaces and stator coupling or separate shaft coupling. Machines and systems are only as accurate, dependable and process-reliable as the components built into them, and this particularly applies to motion control. HEIDENHAIN sets standards in every sense in position measuring technology—the high position detection accuracy of machine tool tables, for example, is a task assumed by linear and angle encoders from HEIDENHAIN. In application areas with simpler precision requirements, absolute rotary encoders from HEIDENHAIN detect rotational movements. HEIDENHAIN absolute rotary encoders are high-precision sensors of measured values with rotational motion, reading position changes with high resolution and transmitting equivalent signals in high quality to the control. Their classic field of application are infeed torque motors and rotary axes in automation processes, and in this function they also essential for the accuracy and reliability of a machine tool, for example with the precise rotation of magazines and turrets in tool changers and in the control of auxiliary axes. Angle encoders, however, are the first choice for the control of interpolatable axes. HEIDENHAIN has integrated its many years of experience as a developer and provider of linear and angle measuring technology in its new generation of absolute rotary encoders. 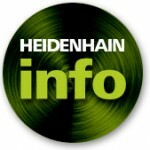 In addition to its range of expertise in measurement precision and reliability, HEIDENHAIN was also able to benefit from close cooperation with leading global control manufacturers, resulting in rotary encoders featuring broad functionality, expanded diagnosis capability and, where needed, functional safety, meaning that users can always depend on the inherent functionality of their machines in addition to high precision. Insensitive to contamination: The absolute measuring method of HEIDENHAIN rotary encoders is the basis for the process-reliable, highly accurate reading of rotational motion. HEIDENHAIN rotary encoders provide machine builders with major advantages in terms of simple, rapid mounting and connection. 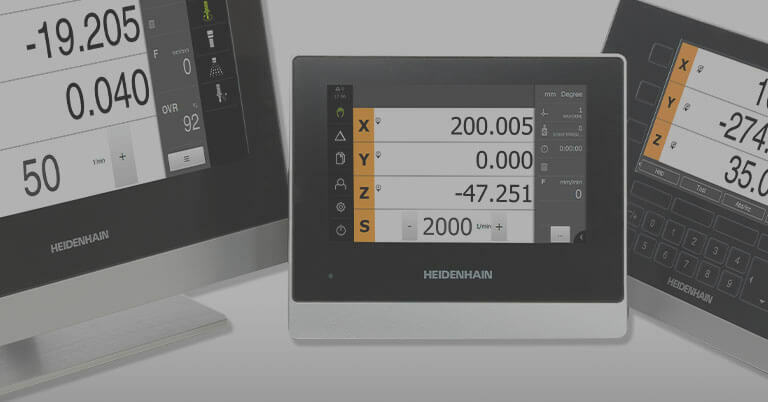 The wide spectrum of custom electronic interfaces that equip HEIDENHAIN absolute rotary encoders ensures simple connections to the machine controls of a very wide diversity of suppliers. Interfaces for direct connection to controls from Mitsubishi, Fanuc α and αi as well as Siemens DRIVE-CLiQ are possible. The EnDat interface, either with incremental signals or as a purely serial interface, is also available, with functional safety as an option. 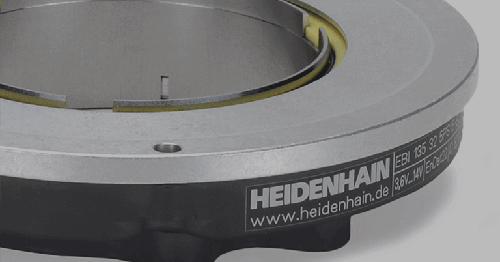 Versions with stator coupling or for separate shaft coupling are available for mechanical coupling to the machine, with both systems having a uniform mechanical connection contour that is completely independent of the electronic interface and typical for HEIDENHAIN. 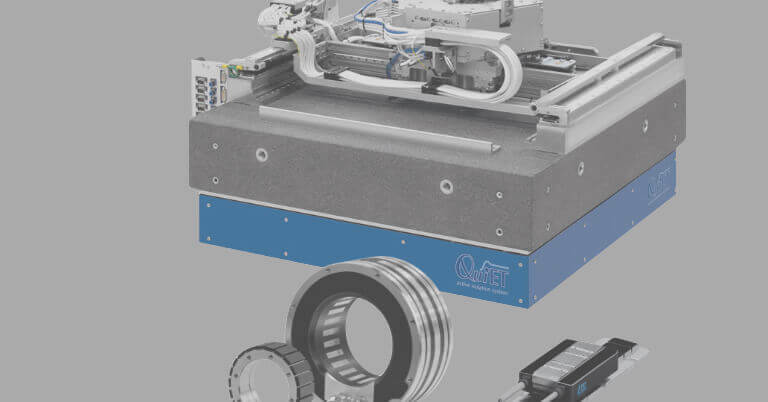 This enables machine manufacturers to mount rotary encoders with electronic interfaces via a single connection contour for a wide spectrum of controls. By virtue of this universality, HEIDENHAIN currently offers the only rotary encoders on the market combining Fanuc or Siemens DRIVE-CLiQ interfaces with a hollow shaft. 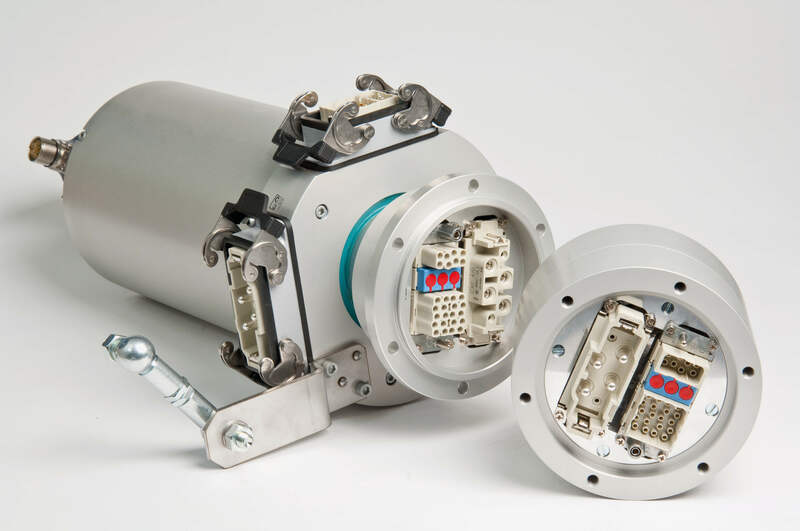 Compact connection dimensions of 56 mm in diameter with a recess depth of 36.7 mm guarantee space-saving mounting in smaller machines and in confined installation conditions. The design of HEIDENHAIN rotary encoders means that they are not only highly flexible in application but are also insensitive to influences from the machine or from the measured axis. 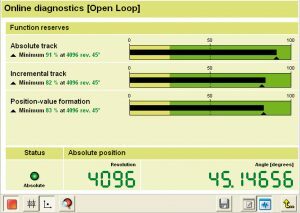 As an example, stator coupling permits axial motion of the drive shaft to ±1 mm without this impacting measuring results, and also compensates any radial runout and misalignment errors of the machine axis. Thanks to their double parallelogram-principle design, HEIDENHAIN rotary encoders with stator coupling are also highly tolerant with axis offsets of the drive shaft (shifts in the X-Y plane), while remaining torsionally rigid. Increased operational reliability: Simple transmission of monitoring and diagnostic information for diagnosis with the HEIDENHAIN PWM 20 phase angle encoder. The high natural frequency of HEIDENHAIN rotary encoders above 1000 Hz also ensures good control characteristics, and is significantly far away from the typical machine tool natural frequency of below 100 Hz, thus avoiding reciprocal influences or amplitude peaks. 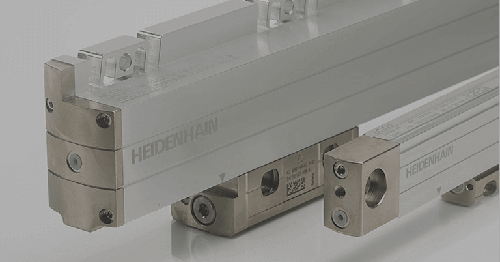 HEIDENHAIN solutions are protected against dust and humidity and are resistant to vibration and shock. They comply with protection to IP 66 in accordance with DIN 60529 and achieve, according to coupling technology, vibration resistance to 300 m/s² in accordance with EN 60068-2-6 and shock resistance to 2000 m/s² in accordance with EN 60068-2-27. The new absolute rotary encoders from HEIDENHAIN feature high resolutions, with singleturn rotary encoders having a resolution of 23 to 25 bits, where absolute position information is repeated with every revolution. 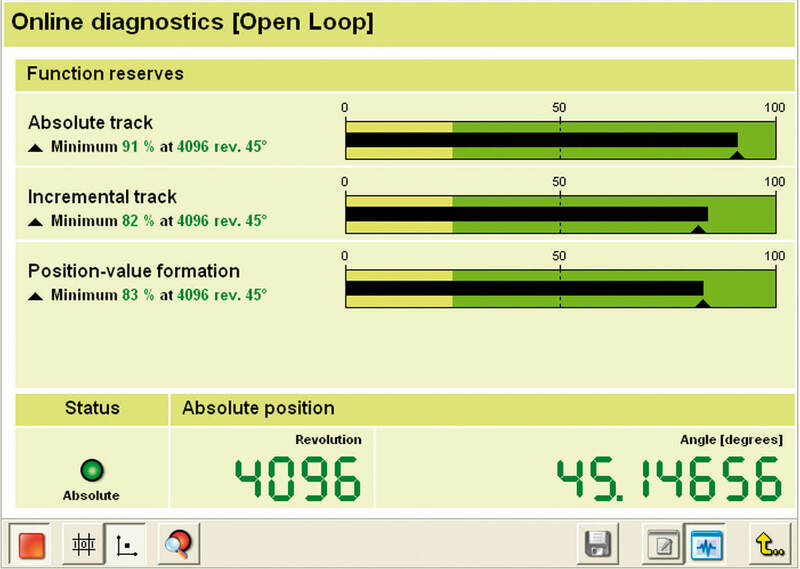 Multiturn rotary encoders can also discern 4096 revolutions. 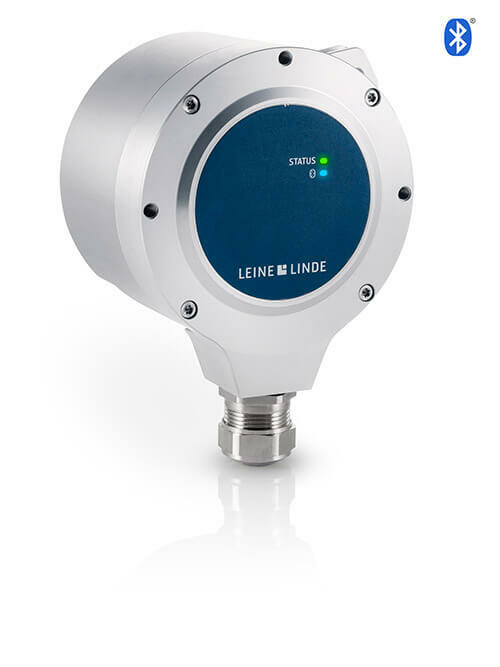 With the absolute measuring method, the position value is available from the encoder immediately upon switch-on and can be called at any time by the subsequent electronics. There is no need to rotate the axis to find the reference position. The absolute position information is read from the graduated disk, whereby a separate incremental track is interpolated for the position value, and this simultaneously serves to generate the optional incremental signal for the EnDat interface. System accuracy is ±20 angular seconds for precise, and also primarily dynamic, motion control. The optical scanning process is a decisive prerequisite for the high measuring precision and operational reliability of HEIDENHAIN absolute rotary encoders, and the large sensor surfaces make scanning highly reliable. 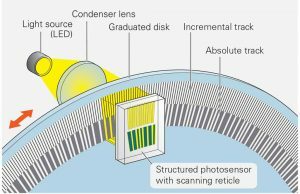 Photoelectric scanning is contact-free, and as such, free of wear. This method detects even very fine lines no more than a few micrometers wide, and generates output signals with very small signal periods. 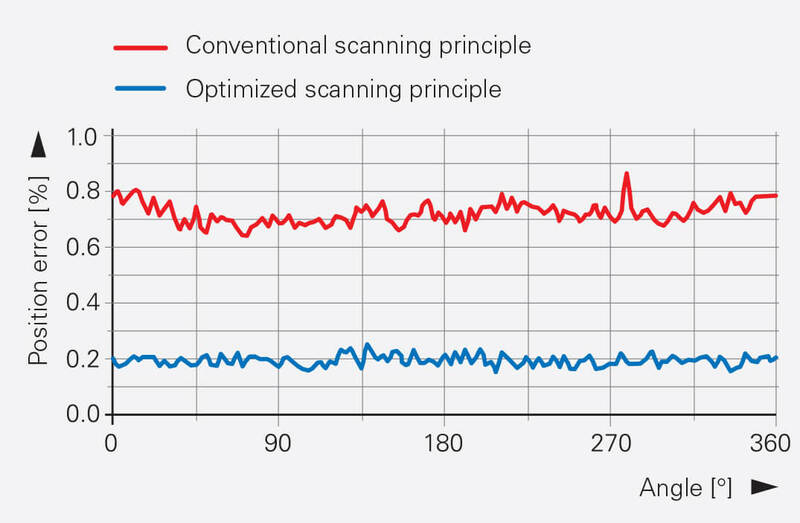 Integral signal generation with single-field scanning: Optimized scanning ensures reduced interpolation error compared to standard four-field scanning. 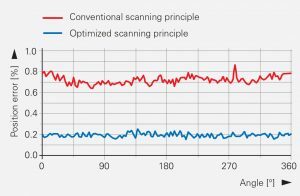 Monitoring and diagnosis data can be transmitted to achieve increased operational reliability, for example with transmission to the HEIDENHAIN PWM 20 phase angle encoder. 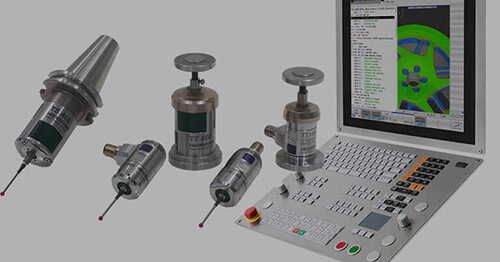 The scope of supply of this encoder also includes the ATS adjustment and testing software for HEIDENHAIN encoders. 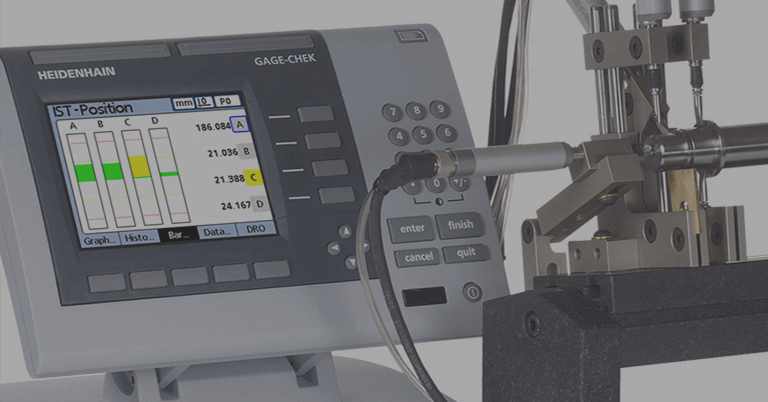 The PWM 20 can be connected to all HEIDENHAIN encoders, enabling rotary, angle and linear encoders to be analyzed with just a single diagnosis tool. With this overall, user-friendly package of mechanical, electronic and functional advantages, HEIDENHAIN provides absolute rotary encoders that are custom-designed for sophisticated applications. Machine builders benefit from the wide range of mounting and connection options independent of the control system used, and users can be confident in the long-term, precise functionality of their machines.